During the American Revolution, the Loyalist Capt. Johan Yost Herkimer had commanded a company of bateauxmen who forwarded supplies from Coteau Du Lac to the British post on Carleton Island. His slave Mink accompanied him during the hostilities. After the war ended, Herkimer settled at Cataraqui (later Kingston) where he received large grants of land. With him he brought Mink, who later became the father of a large family, including George whose oldest brother James became a well known figure in Toronto. George got involved in the livery business in the 1830s, and soon branched out, keeping cabs and carriages for hire. He started winning contracts to carry the mails by stage, and had a tavern connected with the livery stables. When the railroad came through Kingston, the major mail routes were no longer covered by stage. George concluded an agreement with the railroad to carry passengers and mail between the train station and the downtown. He would continue to keep a livery stable and tavern for most of his life. 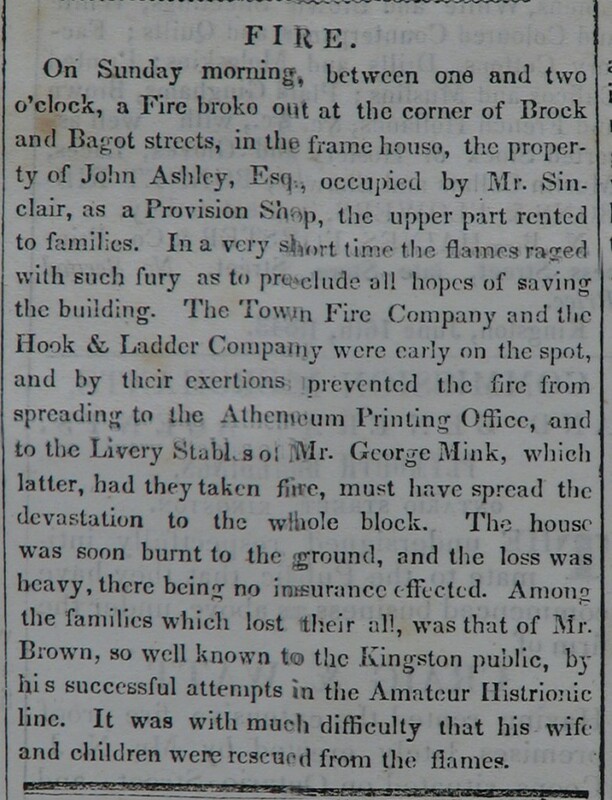 In May 1838, after partnering with Segro Carmino in a livery business for less than a year, George Mink announced to the public that he had “taken extensive premises at the head of Brock Street, (lately the White Horse Inn,)” where they could be supplied with saddle horses, gigs, sulkies, pleasure wagons, sleighs, etc. “Horses taken in to stand at Livery on the most liberal Terms.” He was renting the property from Samuel Mooers, which according to the land registry records, was lot 251. This would place Mink’s livery business between the corner lot on the north side of Brock at Bagot, and the current Queen’s Inn. Fire on Brock and Bagot. In September 1840 he informed the public that he had enlarged his premises, and was running carriages to the Race Ground on Race days every fifteen minutes, from the White Horse, Brock Street. The 1842 Census for Ward 4 lists tenant George Mink as a tavern keeper (while here he had a tavern license every year from 1839 to 1848), with Samuel Mooers still the owner of the property. There were 3 male and 6 female “coloured persons” in the family, as well as many other “servants” who were likely employed running the livery stables. By this time he was also seen as a leader of the black community. He held a “meeting for the Improvement of the Colored population” at his house, attended by several prominent members of the anti-slavery movement. The meeting ended with the establishment of a committee — George was one of two black members — to further the goals of those attending. Through the 1840s he continued to expand. He started a stage route across Wolfe Island to connect the ferry from Kingston with the ferry to Cape Vincent. He acquired a mail contract for this route from October 1846 to October 1850, and successfully tendered for the Loughborough route in 1847. The 1847 Assessment Records give a good indication of how well George was doing. In St. Lawrence Ward he was still renting from Samuel Mooers (lot 251) as well as from Martin Staley on the adjacent lot (231). Since the current Queen’s Inn, which sits on part of both lots, was built in stages, it is possible that George was renting part of the current building, or may have been using the property behind for his stables. John Breden was also renting him a house in Ontario Ward.